The Bubble Bib Necklace: Splurge or Save? ...but as much as I love J. Crew's flawless rendition, Forever 21 makes it all too easy to save by offering us this amazing polished stone bib necklace for just $13.80. The colors definitely give each necklace a totally different vibe, but I'm loving the brilliant blues—so right for spring. What do you think, would you splurge or save on this trend? 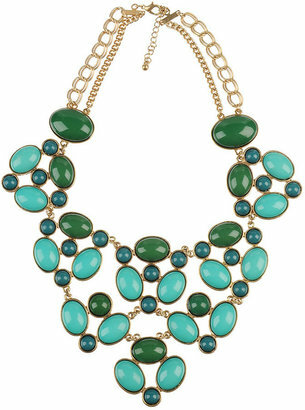 I just saw that necklace last evening on F21's website and I adore it! Sometimes I am amazed at how cheap F21's jewelry is- but I also think some of it is cheaply made too. The JCrew one would probably last longer but I'd still buy the F21 one for a season or two!! This is definitely a save! While it is true the J Crew one will probably last longer because of the craftsmanship, you cannot beat $13.50! And the colors of that F21 are awesome! This is an accessory that will add a color pop to any outfit! I'd go F21 for sure. Save! 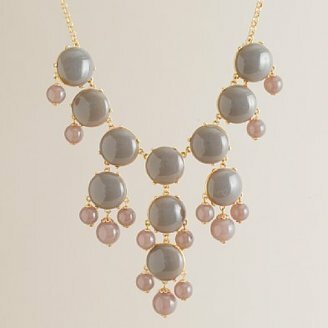 I feel like I could wear this type of necklace only so many times, so why spend a lot. Save - the F21 version is just as cute. Also, I love love love this one which looks like something right out of grandma's jewelry box. The best thing about ETSY is you can usually do custom orders, so you get the color you want - and you can follow the trend, but not wear the same piece as everyone else. Gorgeous! and you're right, they look plucked from J. Crew or Anthro. Etsy delivers again. I'd go for the J. Crew one...but find it on ebay or wait for it to go on sale. I actually found a couple yesterday of the J. Crew bauble necklaces on ebay! Heads up everyone: F21 has an amazing tear drop statement necklace, bet it will sell out fast! I would purchase on that is less expensive. This trend is going to be short lived !